The dream of life on the water is taking on an entirely new dimension in Dubai. In the Persian Gulf, “The Heart of Europe” island development is currently coming to life. One of these islands will become home to “The Floating Seahorse” composed of partially submerged villas conceived just like boats, only without the motor. They share one spectacular feature in common: the lower level has vast panoramic windows looking out onto a coral reef. Named after nature, seahorses are set to co-inhabit this marine paradise with the new residents. 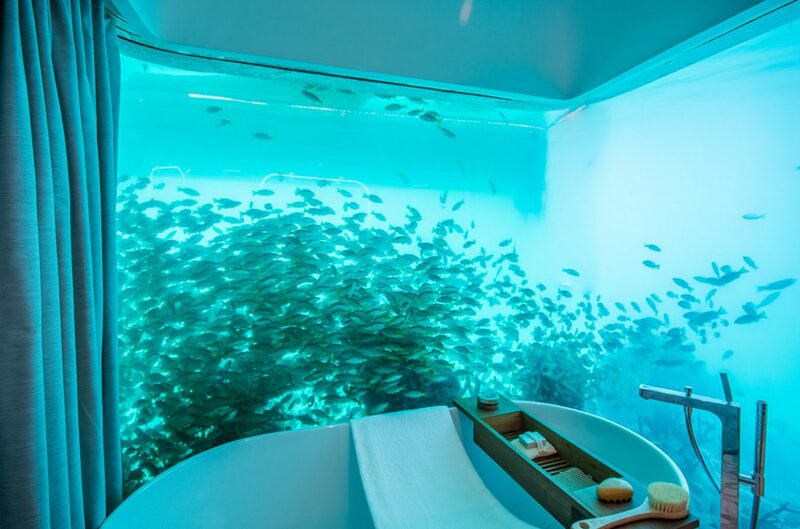 The view from bed down here is like a scene straight out of a James Bond film: A richly vi-brant coral reef, showing off its unbridled wonder behind 15-centimetre thick acrylic glass. Complete with endless stunning shoals of luminescent fish frolicking in the turquoise Persian Gulf. 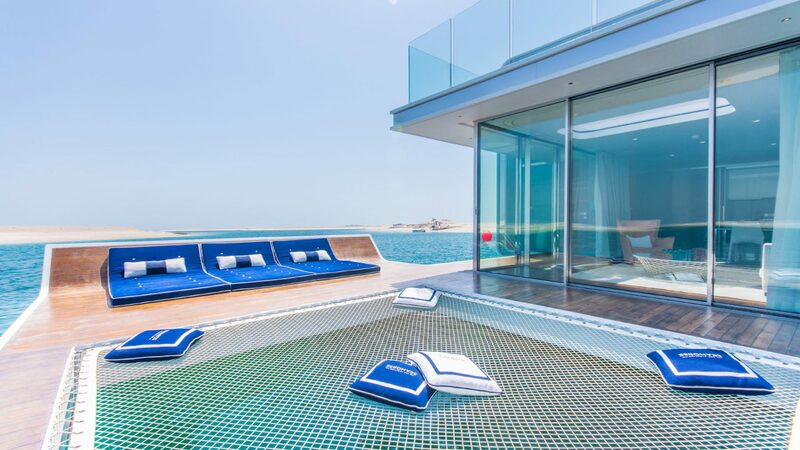 “The Floating Seahorse” is a floating villa off the coast of Dubai that offers breathtaking new perspectives of the sea bed, with a bedroom and two bathrooms submerged underwater. And soon – thanks to the envisaged plan – seahorses will also be on full show amidst this marine spectacle. 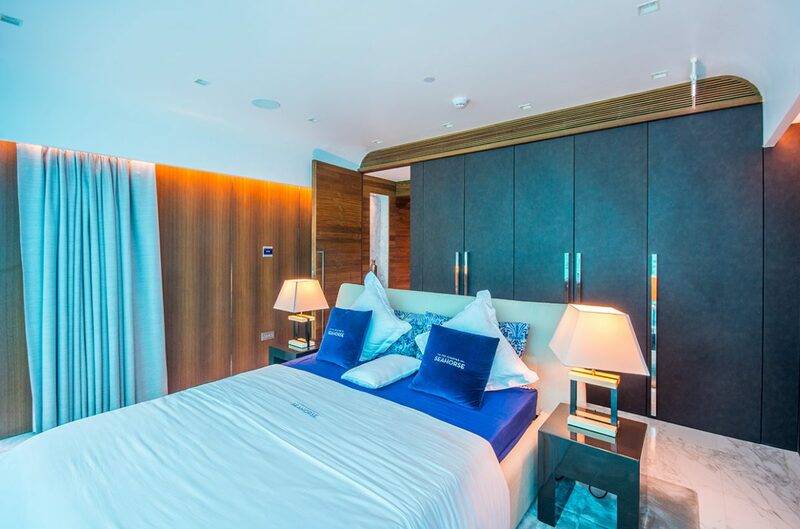 The name of the luxury houseboat is inspired by nature, as the Austrian investor Josef Kleindienst explains: “Seahorses are an endangered species. We have therefore created artificial coral reefs beneath the floating villas where seahorses will dwell undisturbed in future, breeding and multiplying.” The entrepreneur, CEO of the Kleindienst Group, is the co-initiator of “The Heart of Europe” project. Six artificial islands are being created off the coast of Dubai to realise this vision. They will, in turn, form a part of the even larger development known as “The World”, an archipelago of more than 200 artificial islands set to form a map of the world from an aerial perspective – and which will even be visible from space once complete. More than 320 million cubic metres of gravel are being dredged from the seabed here to form the man-made islands: America in the west, Europe and Africa roughly in the middle, the Middle East and Australia to the east. A 27-kilometre artificial reef, which is taking shape from 34 million tons of rock, will protect the archipelago from strong currents. The islands themselves will boast all manner of amenities from hotels and luxury homes to restaurants, bars, clubs and holiday complexes. The island of “St. Petersburg” will be formed for the main part of floating villas. Their name: “The Floating Seahorse”. Conceived by a team of architects at the Kleindienst Group. The first of these incredible homes is already lying at anchor having been built in a dry dock in Dubai. With a hull welded in steel and the remainder of the structure in fibreglass, the overall construction weighs around 240 tons in total. A sophisticated anchoring system, aligned around 40 centimetres beneath the surface of the water along the side elevation and therefore out of sight of the panoramic windows, holds the vessel-like structure in place and prevents any lateral drifting. Tidal movements bringing shifts in water height of up to 2.5 metres can be easily accommodated. “The Floating Seahorse” features a kind of landing stage linking it to the water and electricity grid, as well as other supply networks on the islands. Additional solar panels on the roof of the top deck generate additional electricity in an eco-friendly way. 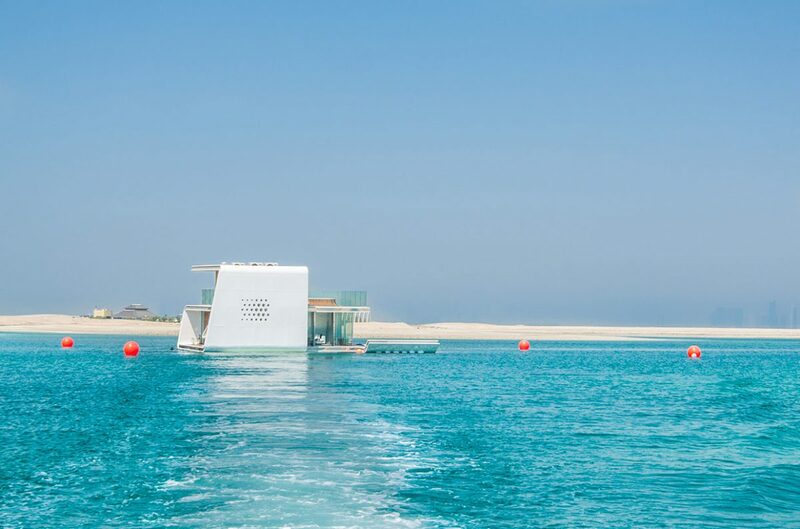 The impressive floating residence off the coast of Dubai has three levels: the approx. 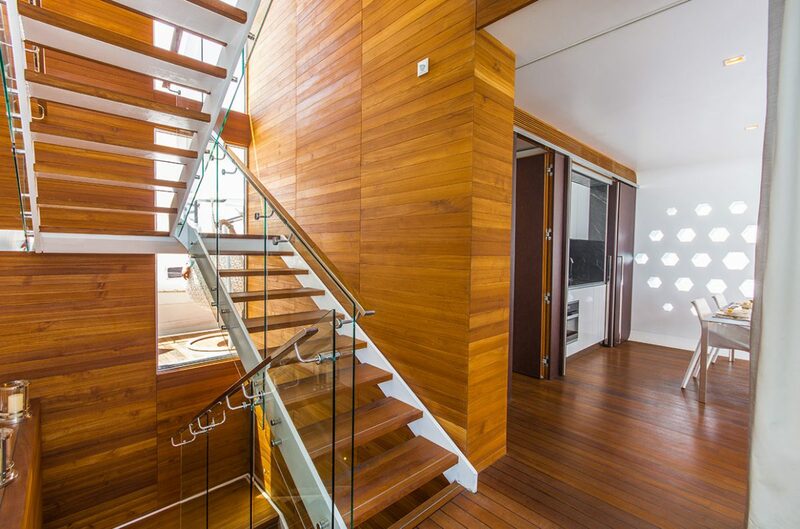 79 square metre upper level presides over an al fresco bar with a kitchenette and a whirlpool. Its glass bottom forms a skylight for the living room beneath. A diwan for spending relaxing hours lounging on during the day tranforms into a bed under the firmament at night. Up here on this deck is the perfect place for a dinner with views of the starry sky, or for throwing a party with friends. The middle deck, spanning some 152 square metres in total, forms a consummate living space with an almost loft-like feel. The open plan living area gives on to both the dining room and the kitchen. These interiors can also be separated off into individual rooms if so desired in the form of drapes. The window frontages, stretching from the floor to the ceiling, can be retracted entirely, so that the views out to sea can be enjoyed without any obstructions whatsoever. The outdoor part of the deck has been designed with a specially conceived area for sunbathing, and also features a ladder for climbing down into the water for a swim. One section of the deck also has a glass floor revealing the underwater world below along with the artificial coral reef garden. The marine life – which includes the corals themselves – has been specially planted in front of the bedroom window of “The Floating Seahorse”. It originates from the submarine environs of the “Burj Al Arab”, Dubai’s luxury hotel that was built on an artificial island back in the 1990s. 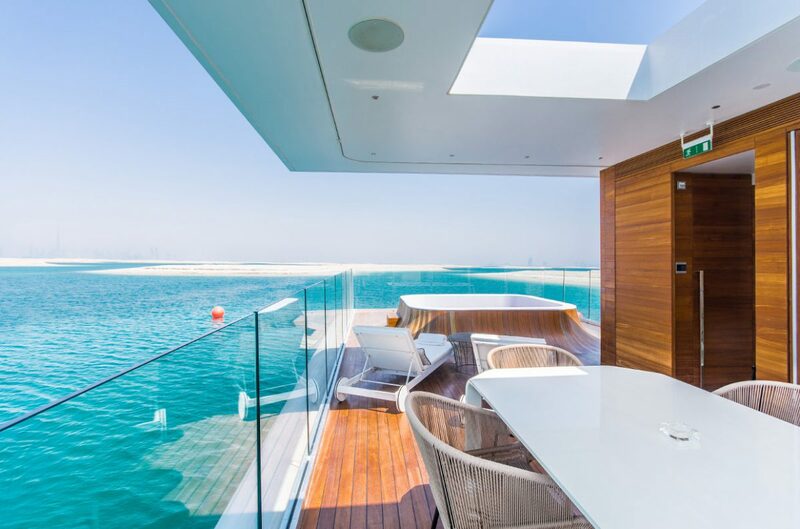 Josef Kleindienst is convinced that “The Floating Seahorse” is destined to set brand new standards worldwide on the market for luxury lifestyle – even in Dubai, which is not exactly lacking in outstanding architectural design. He has had all the interiors appointed with particularly upscale materials including marble, wall panelling and parquet floors made from hardwoods, leather, glass and chrome. 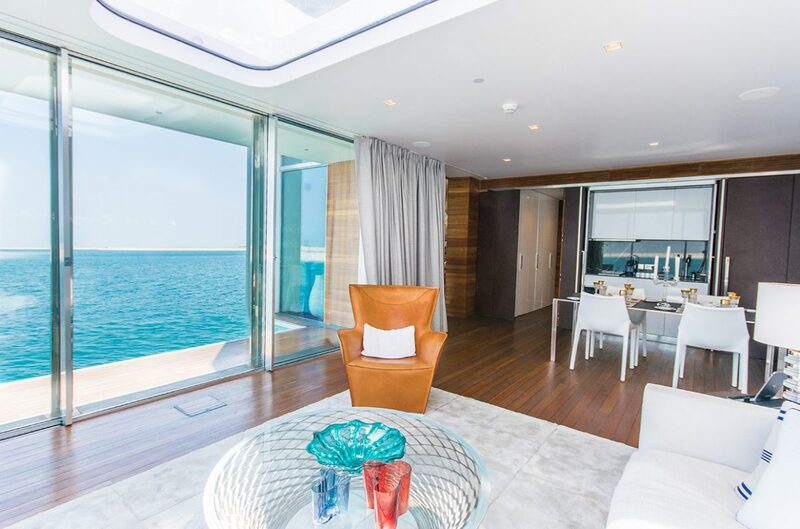 Complementing this level of exclusivity, “The Floating Seahorse” is fitted with the very latest technologies such as air conditioning systems that can be individually controlled for each deck. The feeling evoked by this oasis is certainly nothing short of unique. At any one given time it can feel like a luxurious villa, at other times a sensation akin to life aboard a superyacht – and all the time the glistening skyline of Dubai forms a spectacular backdrop on the horizon.